Read on to get the details. 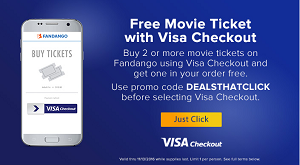 This weekend, you can get one movie ticket free when you buy two or more tickets at Fandango using Visa Checkout. This offer is good to see any movie at Fandango partner theaters in the US. To participate, order two or more movie tickets in a single transaction either on fandango.com or via the Fandango app, then use promo code DEALSTHATCLICK and pay with Visa Checkout. For complete details or to take advantage of this promo, visit this link. Read on for the details. Chase is upping the ante in the small business credit card market. It just announced that a brand new card, the Chase Ink Business Preferred, will debut later this year. The card will have a 80,000 point signup bonus, which will require new cardmembers to spend $5,000 in their first 3 months. The card will also earn 3 points per dollar for the first $150,000 spent on travel, telecommunications, shipping and advertising on social media and search engines. Purchases beyond that limit or in other categories will earn 1 point per dollar. The card will have a $95 annual fee, waived the first year if the account is opened at a branch. Marriott is taking the next step in its merger with Starwood, this time with its co-branded credit cards. As of today, Starwood Preferred Guest American Express cardmembers can now earn 2 Starpoints for each dollar of eligible purchases made at participating Marriott Rewards hotels. SPG Amex cardmembers will also continue to receive 2 Starpoints per dollar spent at Starwood hotels and resorts. Participating Marriott brands include: Marriott Hotels®, The Ritz-Carlton, BVLGARI® Hotel & Resorts, EDITION®, JW Marriott®, Autograph Collection® Hotels, Renaissance® Hotels, The Delta Hotel by Marriott, Marriott Executive Apartments®, Marriott Vacation Club, Gaylord Hotels®, AC Hotels by Marriott, Courtyard by Marriott®, Residence Inn by Marriott®, SpringHill Suites by Marriott®, Fairfield Inn & Suites® by Marriott, TownePlace Suites by Marriott®, Protea Hotels®, Moxy Hotels®. Since 2010, American Express has promoted shopping at small businesses during the holiday season through its Small Business Saturday initiative. Back then, it offered a $25 statement credit for spending at least $25 at a small business on the Saturday after Thanksgiving. Over the years, the promotion has steadily become a lot less generous. Fast forward to this year. In lieu of rewarding spending at small businesses on a single day, American Express is offering eligible cardmembers the opportunity to earn 2X rewards when they enroll one of more than 50 eligible Amex US Consumer and OPEN Small Business cards and shop at eligible small businesses through December 31, 2016. 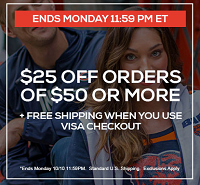 Through October 10, 2016 or while supplies last, you can get $25 off your qualifying order of $50 or more at Fanatics.com plus free shipping when you pay with Visa Checkout. There are, however, a long list of exclusions. Today, Sam’s Club announced that it would double the cash back earned on their Sam’s Club MasterCard for 90 days for anyone who opens a new account between October 1 and November 12, 2016. As the card normally offers a competitive “5-3-1 cash back program,” earning 5% cash back on gas (on the first $6,000 per year, then 1% afterwards), 3% cash back on dining and travel, and 1% cash back on all other purchases, this means that new accountholders would earn 10% on gas, 6% on dining and travel and 2% cash back on everything else for 90 days. 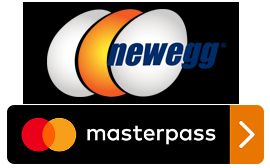 Through October 31, or until funds are exhausted, you can get $25 off your purchase of $200 or more (before taxes or shipping) at Newegg when you pay with Masterpass. Masterpass is Mastercard’s virtual wallet, similar to PayPal or Visa Checkout. To take advantage of this offer, enter promo code MPGAMER16 at checkout and then pay with Masterpass. This offer cannot be applied to pre-order or gift card purchases and cannot be combined with other promo codes, combos, or promotions that include a free gift. Limit one discount and one promo code per customer. For more info on this promotion, see newegg.com/masterpass.